You can copy and paste whole clips in the timeline with Premiere Pro, but you can also copy and paste applied Motion Effects. Anything you’ve done on one clip can be transferred to another, such as scale, position, any video and audio effect. Select the clip in your timeline that has the effects applied, then right-click it and choose copy. This technically copies everything (including the clip), but the secret is in the pasting. Next select the clip you’d like to apply these effects to, right-click it and select Paste Attributes. 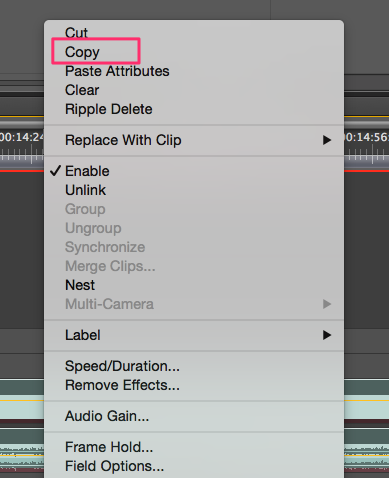 More recent versions of Premiere Pro allow you to select which attributes to copy, which is a nice touch. I’m still on version 5.5 and don’t have that feature, so all attributes will be applied to the clip. You can always selectively delete attributes you didn’t want to copy, or if this gets annoying, apply only what you need to a “dummy clip” and copy/paste that.